Potential wood waste markets include feedstock for composite materials, fuel for energy generation, animal bedding, and soil amendments. Due to the bulk, the recycled material is generally processed locally so that it does not have to be transported over long distances. The ANDRITZ Universal Shredders FRX and FRP are superior multi-talents at work and handle bulky wood waste inputs easily. Wood waste such as offcuts, veneers, boards from demolition projects, construction sites, and timber processing operations can be effectively processed with ANDRITZ shredding technology. The slowly rotating ANDRITZ FRX and FRP shredders can process large quantities of wood and even huge logs into manageable sizes (10 to 200 mm). The output size is determined by the screen choice. A hydraulic pusher feeds the wood waste to a special knife geometry that is easily optimized for the type of input material. The rugged shredder technology provides perfect continuous cutting and high throughput up to 50 t/h. The Fine Grinder HK can be used to mill down the pre-cut wood further, to just a few millimeters in size. The powerful single-shaft shredder FRP enables one-step processing to obtain particle sizes down to 10mm. 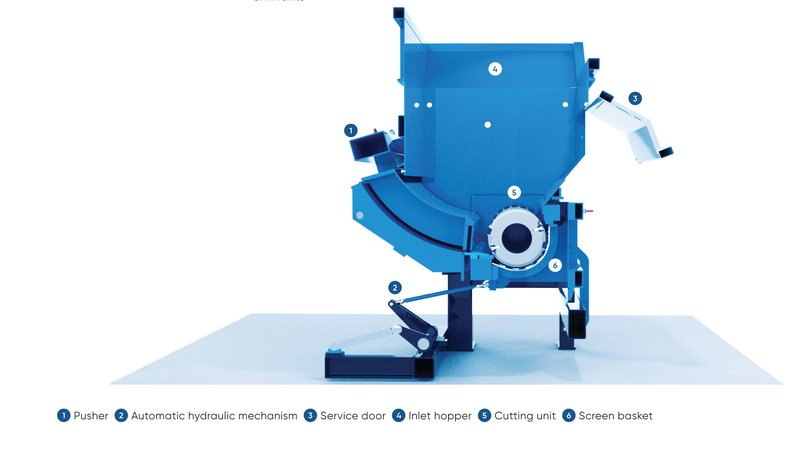 The continuous cutting system of the FRX shredder uniformly cuts down even the bulkiest materials.